Hi its me K again already. This wasn't my book to read but I did anyway because my mom asked me to help G with his. 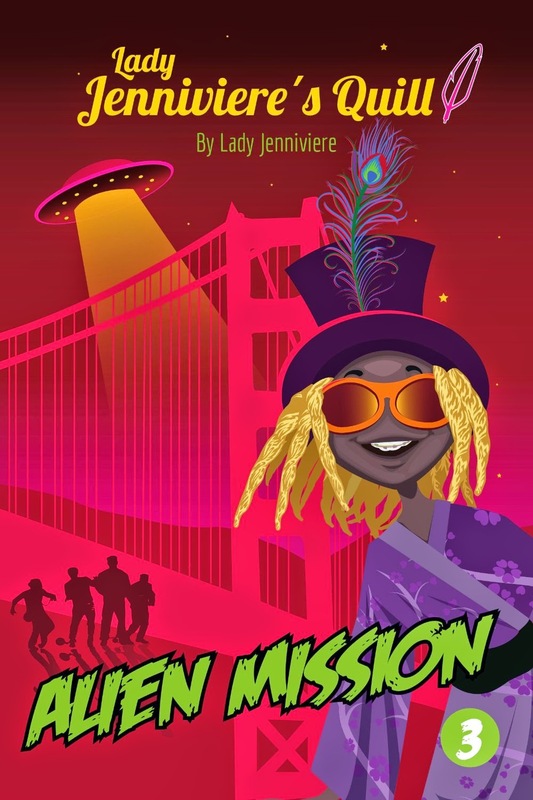 This one is called Alien Mission 3 by Lady Jenniviere. You can get this book on Amazon for $3.49 here. Not my kind of book but mom asked me to help so here I am. G did not help at all beyond saying that he read it and it was good so no help from him. I didn't like how the main character went to Alcatraz and spent the night there and thought that it was haunted. My favorite part was how the aliens knew so little about Earth so they thought that witches, vampires, etc were real but they weren't so sure about things like tectonic plates, tsunamis, or volcanos. The story is about an alien on a planet where things are backwards like kids go to work and adults go to school, night is when the sun is up and the day is when it is down, they even sleep with the lights on lol. He is basically a nerd on his planet and has no friends so his mom gives him a present that grants wishes. He wishes for a perfect friend and it shows him a picture of a human in San Francisco. So he goes on a mission to find her. He wears a disguise so people wont think that he is an alien. So new I get to go back to my review I wanted to do finally.